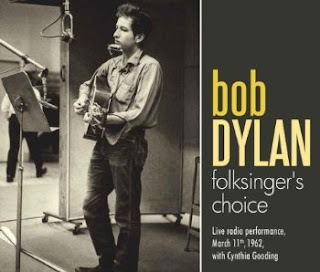 So at last Folksinger's Choice - the famous Cynthia Gooding WBAI radio show featuring young Bob Dylan and broadcast 11-3-1962 - is official released, or isn't it? There is something strange with this CD album, available since august 2010. General recognized as an important landmark in Bob's starting career, it didn't make it to his official website. It just didn't get any attention at all, as if it was a rejected painting. Also, it's in the US only available at Amazon.com from other sellers shipping from the UK. Outside the US, Amazon has it not only in stock, but also available as mp3 download. Is there a different copyright legislation for older radio programs in those countries? Anyway, record company Leftfield Media, cannot be found on the internet. Even on my more obscure blues records there is an address, but here you can only find the name of the company, not even the country of origin.. 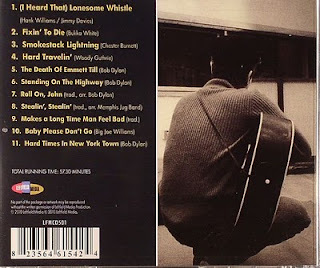 The disc itself has 21 tracks, 11 songs interchanged with chat. Nothing wrong with that, but the artwork gives only those 11 music tracks. So, if you play track #19, you have to translate that to #10 to know it's Baby Please Don't Go. Keeps you sharp and alert. Info in the 8 page booklet is something taken more care of. The notes by some Deryck Gordon are detailed and informative. But then, there is a strong resemblance with the related entries in Derek Barker's The Songs He Didn't Write. It's all a bit shorter, more compact, but sometimes sentences are (almost) the same. Not so original after all. 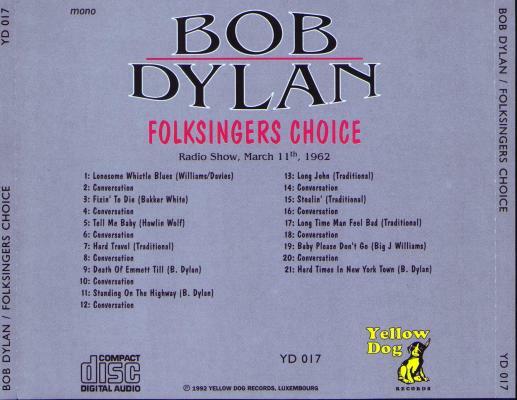 The recording is presented here as a live radio performance on 11-3-1962. In the liner notes this date is even given as "probably". But well known sources agree that the recording was made around the second half of january 1962, at the WBAI studio, and broadcast on 11-3-1962. So it was not live and that brings us to another point. If it wasn't live, it was recorded and so there must be a tape. And even when it was live there must be a tape. If my memory serves me well it was Albert Ayler who once said on Dutch radio: :When music is played, it's gone, it's gone in the air and you can never catch it again." Dylan collectors know that is true, unless you tape it. Nowhere in the liner notes is the source mentioned, nor is someone thanked for providing it. There is even no linage at all, no name of a technician, no remaster, no nothing. Of course the recording is not new for us. 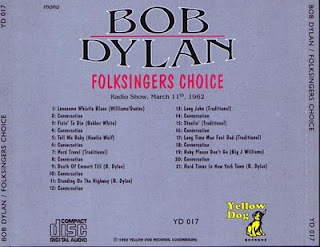 Since 1992 the radio show is circulating as bootleg under the surprising title Folksingers Choice, with all 21 tracks described. But that's another story. You're right. Outside the US, different rules apply to radio broadcasts. Interesting loophole, and some good CDs: this Bob one, a good Springsteen one, and a v good Tom Waits 1975 one upcoming.